After making all those cookies, I found that I was a tad bored on the days following the bagging and packing of the cookies. My heart still longed to bake. So, I dug through my recipe box and found something that my friend had given me. It was a note on making biscotti the easy way. 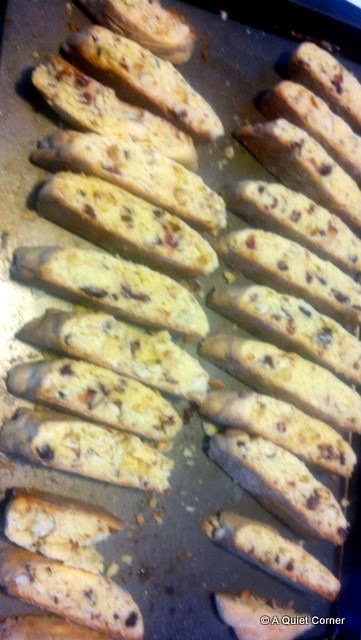 I whipped up a batch of Cranberry Almond Biscotti! These are for the Pres and I.
I only made biscotti once, and my way was much more complicated. I like your method! I still have cookie baking supplies on hand...I've warned the daughter to expect a few more tins in a while. I don't need this stuff hanging around tempting me. This this looks so good - I want to try! The recipe is on the bread mix box? What brand? I can't remember my heart ever longing to do anything in the kitchen. My husband's does though, he fully understand the connection between love and food in the tradition of the American South. A correction: The first name of the author I mentioned is Rosamund, so Rosamund Lupton. A fun mystery with a huge twist at the end, Sister. Home baked is the best! These look yummy. I've only made biscotti from scratch and they are time consuming with the double baking. I made soup for supper.. those would be good with my soup..Going to take Ben to Play Therapy and I'll stop and see if WalMart has the Cranberry Bread Mix.....Thanks~! You are always so informative in making something and tasting yummy... Have you worked on that Cookie Cook-book yet? Your biscotti looks delicious and easy to make.. Thanks for sharing, have a happy weekend!